Etching by Antonio Fantuzzi, 28.3 x 26.6 S (London). Bartsch, XVI, 1818, 423, 114, as Anonymous, School of Fontainebleau, but appears to be by Fantuzzi. Herbet, II, 1896, 273 (1969, 69), 15, and V, 1902, 81 (1969, 233), as Fantuzzi. Zerner, 1969, A.F.64, but Fig. 61 (Vienna), as probably 1543. COLLECTIONS: London, 1854-5-27-126. Vienna, I.III.3, p.44, printed in red ink. Kusenberg, 1931, 166, as in the style of Rosso, and perhaps after a lost decoration at Fontainebleau. Zerner, IB, 33, 1979, 390 (London). Only Kusenberg mentioned Rosso’s name in relation to the design of this cartouche. But the graceful poses of the figures seem closer to Primaticcio. 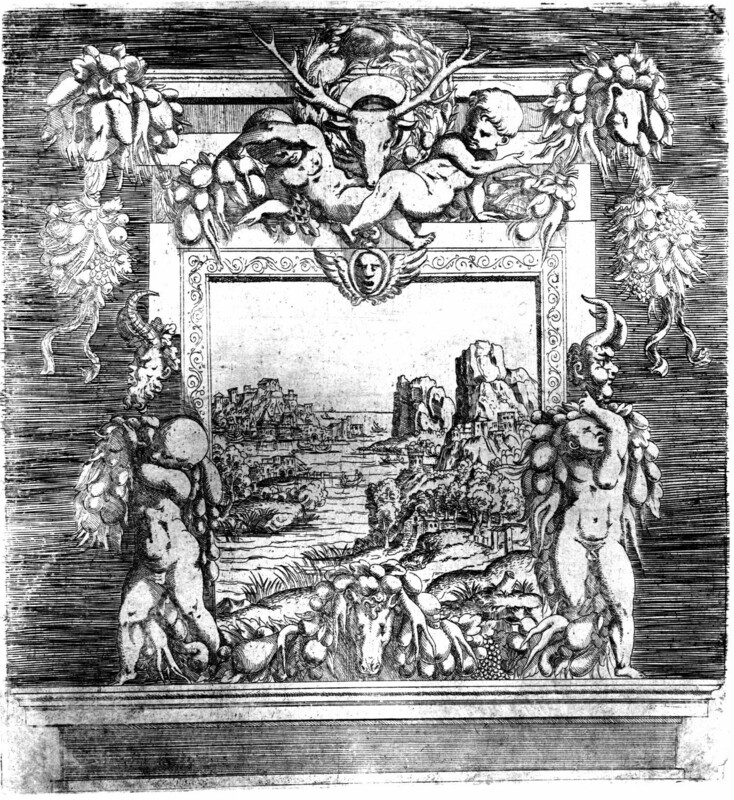 Zerner suggested it is a design for over a fireplace in which Fantuzzi has put a landscape in place of whatever other scene was originally intended. The architecture beneath the cartouche could be the mantel of a fireplace, but it could also be the cornice over a door. Given that the château at Fontainebleau was partly a hunting lodge, it is not unlikely that this cartouche, with its stag’s head, horse’s head, and dogs’ heads, reflects a decoration intended for that location. COPIES: Anonymous. Without the landscape (in same direction?). 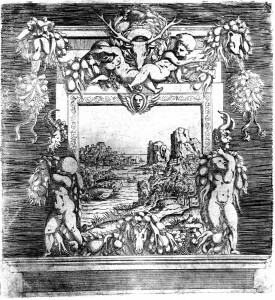 Etching, 17.8 x 18.8 (Herbet, Paris, Ensba). Inscribed at the bottom: 1543. Herbet, II, 1896, 273 (1969, 69), 16, as Fantuzzi, and a variant of Herbet 15. Berliner, 1925-1926, I, Pl. 115, 2, Text Volume, 41, as Anonymous. Kusenberg, 1931, 166, as Fantuzzi, in the style of Rosso, and perhaps after a lost decoration at Fontainebleau. Zerner, 1969, XLI, as not by Fantuzzi. Du Cerceau. Etching. Herbet, IV, 1900, 305 (1969, 155), VI (Petits Cartouches), 14. The center square area has been changed into an upright rectangle and is without the landscape of Fantuzzi’s print, in the same direction. Du Cerceau’s print was copied by Moro (Bartsch, XVI, 1818, 85, 18, as Schiavone).